Like everyone else, I was very interested in what Pope Francis had to say in his most recent interview. I had seen a couple of the summaries of the interview from both the secular and non secular media. While a couple of them did an ok job talking about the high points. I think most of them, especially the secular media missed an important point. I think, there was one really over arching message. What was that message you may ask. Well before I tell you I am going to give you the same advice many others have given. And in the process I am going to echo Reading Rainbow. “Don’t take my word for it.” Go read the entire article here. It is rather long but it is really worth your time. You went and read it right? No? Well before you continue you really need to read the article so here it is again. 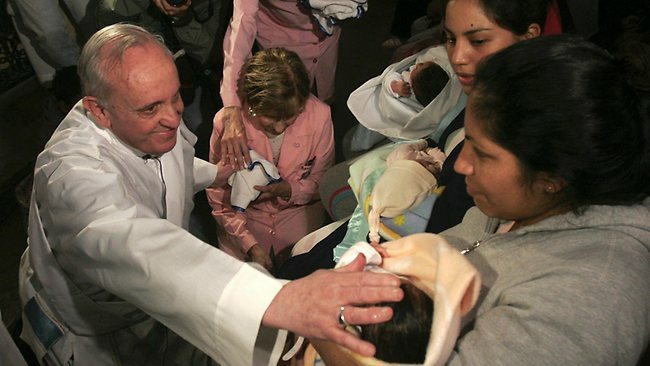 I don’t think that I can cover all of the topics that Pope Francis talked about. I don’t have a hope of being able to analyze it as well as some of the professional journalists or and more particularly the theologians. Having said that let me give you my thoughts on this interview. 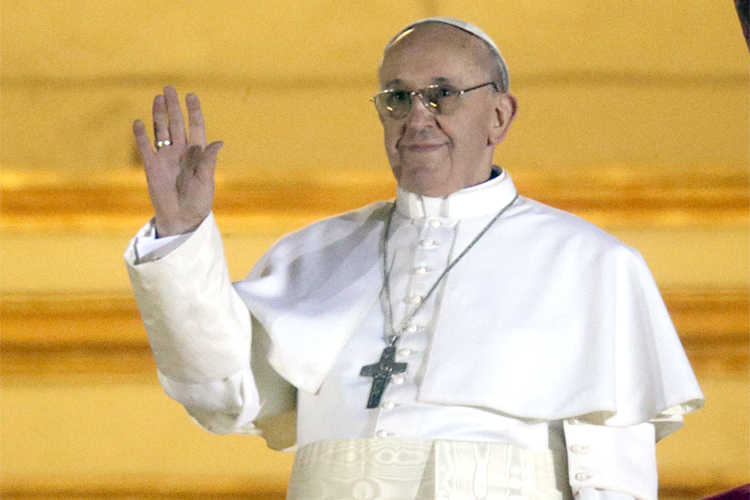 First, Pope Francis did not say anything new. He really didn’t. To understand what I am talking about let’s start here. 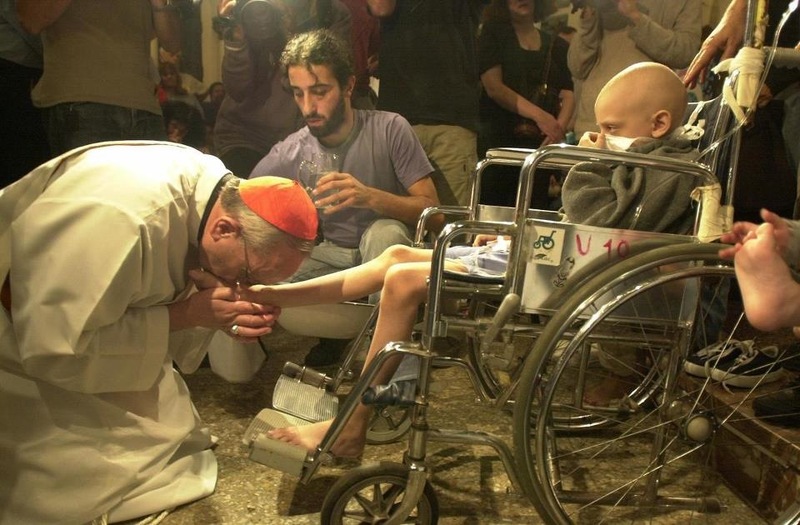 This picture or one like it has been circling the internet likely since the first day that Francis became Pope. And a lot of people are making a big deal of the differences between Pope Emeritus Benedict XVI and the now Pope Francis. But I think that this picture says it much better than anything else. 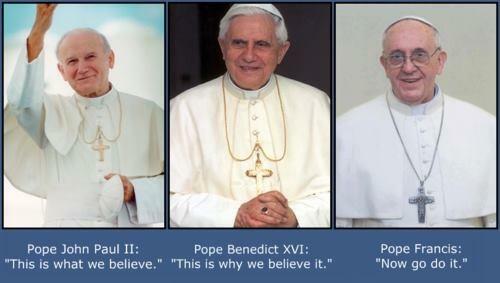 All three of the last three popes have had different styles it is true. Pope John Paul II helped bring the teaching of the Church to Her members. He needed to make himself and through him the church, more accessible to the people. Think about World Youth Day. Pope Benedict XVI was an academic and he helped us to understand why the things that Pope John Paul II showed us were true. He did this by digging into the history and doctrine of the church. He was harder to love, harder to understand, harder to follow. Not because he was unlovable or even unlikable, not because he was hard to understand, not that we could not follow him, but for one simple reason. He knew, in depth, in great depth why it was that the things that Pope John Paul II said where true and he gave us those lessons even if they were very deep and hard to understand. He challenged us to learn those things that were hard for us to learn. 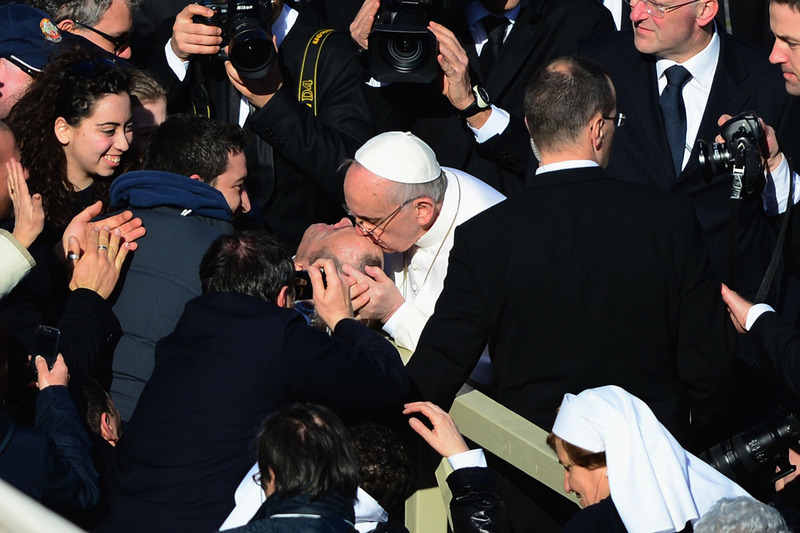 Pope Francis is challenging us again and sometimes makes us uncomfortable. He builds on both of these by taking what both of them have done and showing us how to apply it to our lives. But not just by telling us, but by getting down on his knees and kissing the feet of the sick and the imprisoned, by embracing the poor, by loving those around us that we sometimes think are unlovable. As I said Pope Francis is not saying anything new. But, but, but, you say. And I say wait a minute. In the last 50+ years the Church (meaning her members, all of them) have had a huge learning curve. Vatican II basically took the teachings of The Church and opened them up to Her people making them more accessible to everyone. In doing that it caused a bit of a stir. Everyone from the youngest child sitting in the pew learning his or her catechism for the first time to the Pope and everyone in the middle has had to run just to keep up with it all. And some of us have done so very well, some of us have failed miserably and everywhere in between. I don’t know where I fit on this scale but it is likely near the bottom. The teachings are not changing, it is that we have been given the opportunity to really understand those teachings and there is a lot for us to understand. We have looked to our priests and bishops, our cardinals and especially the Popes for guidance and teaching. What Pope Francis is saying (and this is I hope what he is saying) is that there is a great danger in turning inward. Having spent the last 40+ years learning about what Mother Church teaches us we want to focus on that, to the detriment of actually following those teachings. We focus on one teaching or even a group of teachings and ignore the over arching message of the church. Instead it is time to turn around and share what we have learned. And not only share it but live it. Yes, The Church teachings tell us that contraception is wrong, but we can’t condemn those that use it. Yes, abortion is a terrible thing, but we can’t hate the people who have had them or even those who preform them. Instead we have to love them. All of them. What is going on here is that Pope Francis is saying that we need to stop focusing on the things that divide us and focus on the things that bring us together. After we have healed those wounds only then, can we start talking about the things that make us different. For example, don’t ignore that a couple is living in sin, instead embrace them, Love them, give them of yourself. Help them to understand what we have been taught, what we have been given the opportunity, through the last two Popes to understand. We, the members of The Church, have lived through a time where we have been extremely lucky. We have been allowed to have the time to learn and understand the teachings of the church. With the three best teachers possible. Now it is our turn. Instead of slapping the hand of those who are not following the teachings of the church, it is our job to reach out and take that hand. But the hand is not enough. We need to grasp it firmly and pull the person close in an embrace. For many of us (myself included) that is going to be hard. I have learned to hate those sins within myself and it is easy to translate that outward into hating another who has the same sin. But That is not the right way. We have to instead love them, the way that the last three Popes have loved us and give them the chance to learn what we have learned. The only other thing that is not covered by what I have already said is that the Pope said prayer was important. That also is nothing new. Well said. Thank you for posting.